Sheets Goes the Distance in Brewers Victory ~ The Bucky Channel - The World of Sports from Wisconsin's Perspective. Ever since the Sabathia trade, Ben Sheets really hadn't been pitching the way he was in the first half of the season. 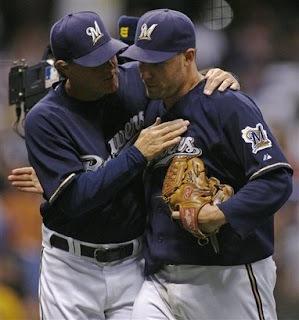 Because of this, the Brewers really didn't see the benefits of having two aces to lead off your rotation. But after Sabathia threw a complete game shutout on Friday, Sheets answered by throwing one of his own on Saturday night as the Brewers beat Washington 6-0. In nine innings of work, Sheets allowed just five hits, no walks, and struck out six batters. He earned his 11th victory of the season, and his first in over a month. The Brewers offense gave Sheeter more than enough insurance on Saturday night, including solo shots from Ray Durham, J.J. Hardy, and Corey Hart. Sheets added an RBi of his own when he singled Jason Kendall home in the 8th. Finally, the Brewers showed what they can do with two aces at the front of that rotation. One bit of bad news however, Ryan Braun had to leave the game with back spasms. He's listed as day-to-day.